The 1900’s started out with revolution and assassinations. Álamos was in the middle of it all. The railroad came in 1908 and left in 1931. The early 1900’s would be troubled times in the Plaza. The Sud Pacifico de Mexico plans to extend its rail line south of Guaymas. The Richardson Construction Company invest in 650,000 acres south of the ¥aqui river for agricultural and irrigation development. John Hays Hammond, associated with the Richardson Company and Boer war hero, is given permission from President Dias dictatorial government for developing and reopening Aduana mines in the Álamos District. He operates the Promontorio and Minas Nuevas mines. He built a smelter near Navajoa and invested heavily in mining equipment. The wealthy have reached a peak of prosperity. Worker unrest escalates with a strike at the consolidated Copper mines at Cananea. Railroad from Navajoa reaches Álamos. Area population estimates included Álamos 3,000 plus, Aduana 1,000 plus, Navajoa 1,000 plus, Promontorios 1,000, Minas Nuevas 1,000 and Camoa 1,000. Report on the Alamos – Promonitos District mines in the Mining and Scientific Press. One of the Aduana mines reaches a depth of 1500 feet. January, Francisco Madero,leader of the Reform Movement, arrives in Álamos. Benjamin Hill is a leader in the Reform Movement. The Aduana mines shut down because of the Madero revolution. The rise in quick silvers prices, used in the reduction process, also made mining unprofitable. Álamos Perfecto Francisco A. Salido denied Madero the ability to speak in a public area. Don Miquel Urres invites Madero into his home to meet with powerful Álamos residents. Minas Nuevas mines are taken over by Amos J. Yaeger. Later, he would shut the mine down and sell mine machinery and smelter for scrap. Northern and central towns are under attack by Maderistas. Benjamin Hill captures Navajoa. He begins to move on Álamos but is ordered to stop and repair telegraph and railway lines damaged in battle. November, Madero becomes Mexico’s president. Early, Pascual Orozco, in Chihuahua turns against Madero, is former ally. Soon Orozco, and an army of 1400 soldiers, crosses into Sonora. August 21, an Orozquistas column reaches Álamos which is defended by 650 federal and national guard troops. Álamos defenders attacked the Orozquistas outside of town at La Aurora. August 22, 10 a.m., the Orozquistas retreat from La Aurora. Fighting continues through the day and the Orozquistas leave supplies and over 100 dead men on the ground. The Orozquistas had stopped earlier at Hacienda de Cedros and Rancho de la Uvalama where they had indulged in aguardiente – tequila?, which they had taken with them as they approached Álamos. President Madero is assassinated. General Victoriano Huerta becomes President. Sonora revolts against Huerta led by Alvaro Obregon, Plutarco Elias Calles, Adolfo de la Huerta and Venustiano Carranza. All four of these men, three from Sonora and Carranza from Coahuila, would become Mexican presidents. Álamos sides with Huerta. Sonora, Chihuahua and Coahuila states take up arms against Huerta. April, Benjamin Hill occupies Álamos as the Huertistas surrender. He takes money from wealthy Álamos citizens and captured Huertistas to support his troops in Sinaloa and repair damaged rail lines. he forced the poor to take down the sandbag barricades in Álamos and return the sand to the surrounding arroyos. August, Carranza becomes head of government. General Pancho Villa, and thousands of his troops, fought against Carranza in southern Mexico. Carranza’s troops won several battles and Villa headed north into Sonora. Villa forces lived off the land and terrorized all who they came across. Mines and ranchos were abandoned. April 8, Maria de los Angeles Felix Guerrean, the famous actress, was born in Álamos. These were turbulent times for the region. Yaquis and Mayos were joining forces with Obregon and Villa’s armies. Venustiano Carranza became the third Mexican President in two years. Wars between Sonoran Governor Maytorena and his military leaders. Well armed and trained Yaquis and Mayos Indians join Obregon and Villa’s armies who sided with Maytorena. Pancho Villa is entrenched in southern Sonora. May 12, 500 Pancho Villaistas attack Álamos. Major Felix Mendoza has 30 troops and 50 citizens to defend Álamos against Villa’s troops. The five hour battle is waged in the plaza and on Loma de Guadalupe. 25% of Mendoza’s troops are dead or wounded. He orders the survivors to surrender and he himself commits suicide. April, General Angel Flores’ Expeditionary Force of Sinaloa regains Álamos in a month. September, the Constitutionalists control southern Sonora. Villa returns to Chihuahua. Indian uprisings create ghost towns in Sonora. Álamos old families remain in ancestral homes. The United States sends the American Punitive Expedition into Mexico after Pancho Villa and his troops had entered New Mexico. Yaguis and Mayos felt they had not be given benefits that had been promised them go on the rampage throughout Sonora. Farmers, ranchers, towns and villages were attacked. Baroyeca becomes a ghost town. September, Obregon becomes Mexico’s president. Recovery from wars begins. Renegade soldiers, bandits, Yaquis and Mayos continue raiding, plundering and killings. Sonora re-establishes schools, roads and farming. Life in Álamos stabilizes. It is now a small mexican town forgotten by many and home to old families. Mansions, neglected by war and neglect, turn to ruins. But Álamos does not become a ghost town. Maria de los Angeles Felix Guerrean’s family lived in Álamos until they left for Guadalajara. Soon Maria Felix’s beauty would be nationally recognized. Last Yaqui uprising ends in total defeat for the Yaquis, they have lived in peace with the “Yoris” since then. One train a week from Navajoa to Álamos. Planning begins on the Mexican link of the International Highway. Some thought the highway may follow the old El Camino Real through Álamos to El Fuerte and south. Eventually it is routed through Navajoa and south bypassing Álamos, which is to the east. 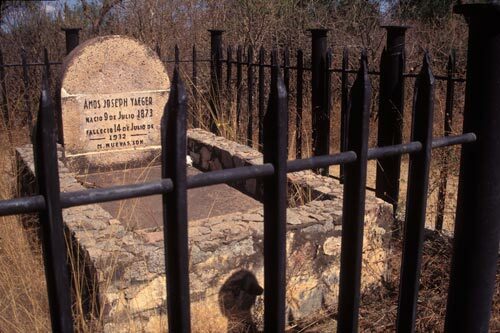 Amos J. Yaeger grave in Minas Nuevas. Amos J. Yaeger dies at the age of 59. Álamos city has an estimated population of 1,000. 500,000 hectares of public lands, “ejidos” are allotted to the Yaquis. The Álamos region had a population of 5,369 men and 4,848 women older than six years. 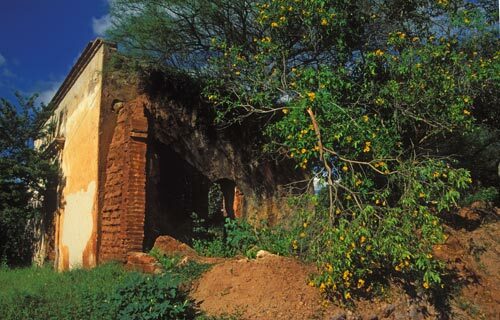 Ruins, like this birhtplace of Maria Felix, are bought and sold. William Levant Alcorn, a Pennsylvania dairy farmer, arrives in Álamos and bought the Almada mansion on Plaza de Armas and restored it as the Hotel Los Portales. Alcorn helped publicize Álamos and had a successful real estate business buying and selling ruins and property. 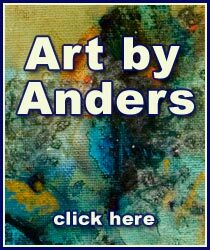 ©2015 Anders Tomlinson, all rights reserved. Looking west, explorer Coronado was struck by this mountain and landscape. The Spaniards called this land Real de los Frailes because of some tall white rocks resembling hooded monks overlooking a small Indian village shaded by cottonwoods. These towering rocks speak loudly. They call for, and command, your attention. In 1683, 143 years after Coronado, two abundant veins of silver were discovered seven miles to the west of present day Alamos. The mines of Aduana and Minas Nuevas, in a zone 4.5 by 1.5 miles, produced an estimated $100,000,000 in 1910 dollars. Aduana is now a sleepy little village amid mine ruins. Soon, Alamos was the richest and most important city on the El Camino Real. Juan de Anza arrived and departed Alamos sometime in the spring of 1775 with local families and freshly mined silver to settle San Francisco. Alamos money and citizens were also vital for expeditions that settled Monterey, Santa Barbara and five years later, Los Angeles. Father Kino used the Royal treasury to finance a chain of missions in northern Sonora and southern Arizona. The Bishop and Governor resided in Alamos, as did the first high school, printing press and newspaper and important trading center. January – de Anza, in Mexico City, begins to organize his expedition to to colonize San Francisco. March – de Anza begins recruiting colonizers in Culiacan, Province of Sinaloa, Mexico. March, April, May – de Anza continued recruiting in the villages of Sinaloa and El Fuerte in the Province of Sinaloa, and Álamos, in Sonora. 30 citizens from Álamos, more than any other community, had joined the expedition, now more tHan 250 soldiers and colonizers. May 1 – de Anza is in El Fuerte. May 13 – de Anza, Espinosa and six presidial soldiers meet up with Moraga between Álamos and Horcasitas. July 22 – September 13 – diary notes indicate de Anza was in San Miguel de Horcasitas, Terrenate, Cocóspera, Mission San Ignacio… During this period of time the Apaches were restless. September 29 – de Anza’s expedition leaves Horcasitas, just north of Alamos. From Pedro Font’s diary notes. October 23 – de Anza’s expedition left Tubac on with some 300 people and 1000 head of livestock. There were no wagons or carts. All supplies were loaded on pack mules every morning and unloaded every night. The expedition was headed to the SF Bay Area following reports of a great river flowing into the bay. The goal was to establish a presido, mission and San Franciso settlement. March – de Anza arrived in Monterey, California. March 28 – Mexican Captain Juan Bautista de Anza, Lt. Jose Moraga, and Franciscan priest Pedro Font arrived at the tip of San Francisco. De Anza planted a cross at what is now Fort Point. They camped at Mountain Lake and searched inland for a more hospitable area and found a site they called Laguna de los Dolores or the Friday of Sorrows since the day was Friday before Palm Sunday. The plaza was the heartbeat of Alamos as it grew in power and prestige. The lure of silver brought international miners from Europe and other continents. On the Sea of Cortez galleons from Asia, Phillipines and Europe called on the port of Huatabampo loaded with cargo, a week by burro from Alamos. They brought luxuries such as silk and satin and the world’s finest furniture. Opera Companies visited. China minted coins here. Merchants came from India and Japanese supervised a silk factory. The indigenous population included Mayos, Yaquis, and Tarahumaras. Hordes of miners and traders, who endured great hardships in their travels, overran Alamos. 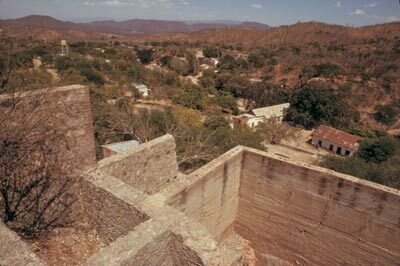 As many as 30,000 people made Alamos their home during the peak of its glory in the 18th century. Here, new Spain was pomp and circumstance with a beautiful Church, grand haciendas built in the style of Andalusia, Spain, flower-filled patios, romantic serenades, elegant carriages, flourishing commerce, and mines that ranked amongst the most productive in the world. The Past is Alive in the Structures and the Sparkle of an Eye. The Plaza was the prize, conquer the Plaza and Alamos was yours. Looking down from the Church at a street sweeper on Calle Comercio. And Then Along Came A Man Named Levant. Not until the 1950’s did a lone American, Levant Alcorn, come to the cobble stone streets, and see the potential for the future. He saw value in the plazas, arches, ornate iron-work, carved wood doors, high ceilings, five-foot thick walls and proximity to the United States International border. Late in his life, a childlike Levant had a quick smile and a fading memory. He began to acquire ruined mansions. Soon, he was selling property to independent Americans hoping to realize their dream standard of living. Restoration projects began and continue today. Now, Alamos has over 200 American families as part of its social fabric. Roofs are always in need of repair. They are also another place to relax. Each wall, every window and door is a story. Where did it come from, how and when did it get here? Was it made by an Alamos or imported craftsmen? There is a prideful sense of ownership that comes with undertaking a restoration project that in reality will never end. And there is a humble realization that the casa is really owned by history and this is but a brief opportunity to be part of a continuum of gatekeepers and masters. and house-help are a team that can last a lifetime. 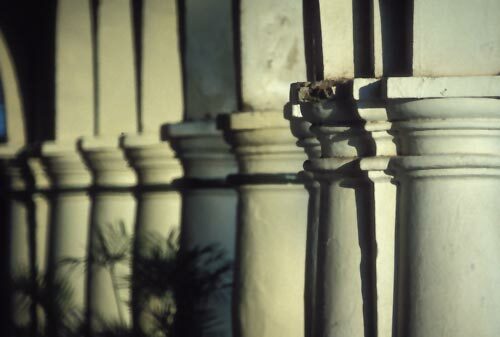 Think of the coats of paint these columns have worn over the past 200 years. An introduction to a Short History of Alamos, Sonora, Mexico. “Here is something Special”, Spanish explorer Vasquez de Coronado noted in 1540 as he headed north, passing by tall white rocks on Alamos de Sierra. This is the opening chapter to “A Short History of Alamos” written, filmed and edited by Anders Tomlinson. Narrated by Bruce Miles. Soundtrack by SonicAtomics and Estudiantina de Alamos. Alamos shares a strong maternal bond, steeped in history, with all the Southwest. Juan Batista de Anza arrived and departed from Alamos in the spring of 1775 with silver, and local families, to settle “Monterey and the Californias”, including San francisco. Another expedition, five years later, left Alamos to settle Los Angeles. The conclusion to a Short History of Alamos, Sonora, Mexico embraces the Sierra Madre. Here, Bishop Reyes’ Cathedral in the Plaza, a three-tiered belfry, shines gold in morning light. Here, looking east, one’s imagination is stirred by the forbidding beauty of the Sierra Madre Occidentals. Together, they shape the Alamos experience.